Although stamps can be photographic or typographic in nature, illustration has been a dominant voice on postage stamps since their inception. The postage stamp is a coveted spot for any illustrator. Before landing this gig, was this a medium that you envisioned for your work? To say that I never thought of having my work appear on a stamp would be somewhat disingenuous. Years ago (this seems somewhat crazy, but the entire process of pitch & production takes...a while), the thought of having my work appear on a postage stamp seemed like one of those far-off, and likely unattainable goals — something perhaps reserved for illustrators much further into their career. ﻿How did the opportunity come about? How the opportunity came about still remains a bit of a mystery to me. 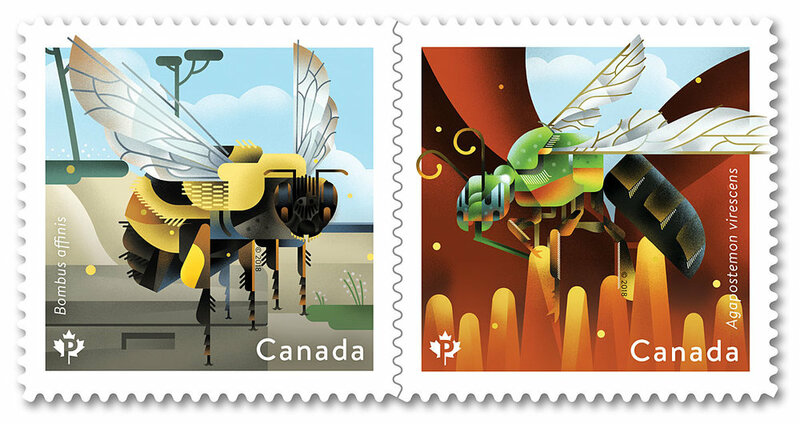 Roughly a year and a half before the Bee stamp pitch came up, I was involved in another pitch for a set of stamps. I know that pitch was the result of promotion through my rep agency. The Bee pitch, however...I'm not sure of, and this is because I never asked how the designer found me. I was just very happy to have another opportunity to potentially have my work on a stamp. Can you share a bit about the process of working on the stamps? The process itself is very meticulous, and measured. Or at least that's how I handled it. It's probably the most work I've put into sketches, and from there, more polished rough comps. There was a lot of back and forth between myself, the designer, and Canada Post, and many check ins for approval at various stages of development. Closer to completion, a bee expert was brought in to provide notes to me as to how to make "my bees" accurate to their real-life counterparts. Definitely the amount of time spent, both working on the stamps, and the waiting. 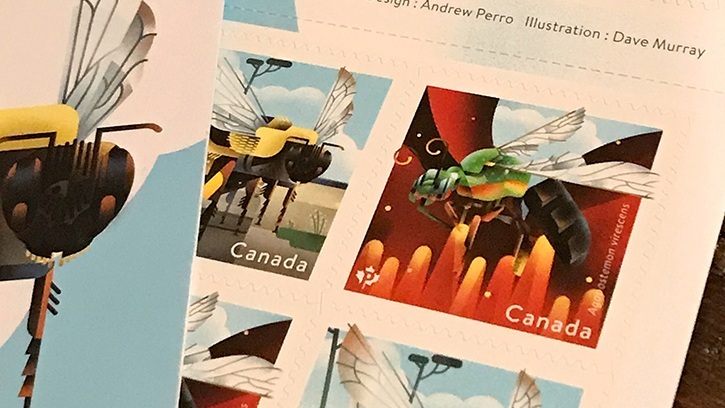 Though not directly related to the bee stamps, another major challenge — likely one of the biggest ones in my career to that point — came with the first stamp pitch I was involved in; the challenge of not having my work selected. I had made deep progress into the pitch, and had received excellent feedback on my sketches and further comps. This feedback was SO positive, in fact, that I was asked to work up a second set of sketches that the selection committee ALSO liked. I set aside a good amount of sleep, and really poured my heart into those two sets of stamps, only to later be informed by phone "Nope, we didn't get it". A short, less-than-5-minute phone call was the abrupt end to MONTHS of hard work. I found that I was quite discouraged after that, and had a hard time focussing on new assignments. Both my heart and brain felt disconnected from the work, and from illustration in general. I did get over it, and I look back on the experience now as invaluable experience in regards to perseverance through the highs and lows of the industry. I'm mentally stronger, and overall a more efficient worker now. One of the perks of working as an illustrator is that we get to research and learn about the subjects of our illustrations. 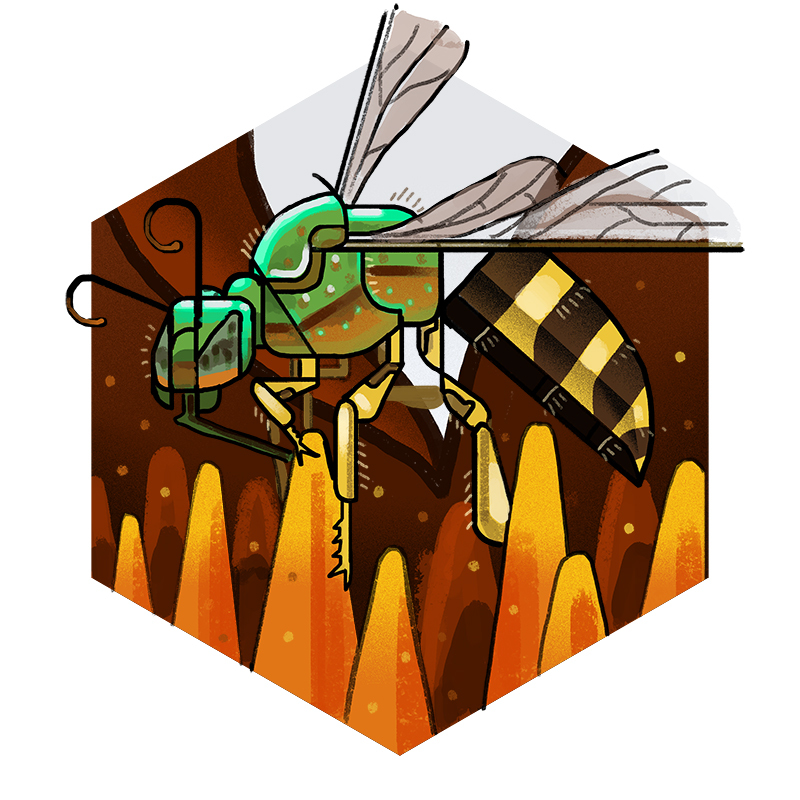 Were you already actively interested in bees and their endangered status before embarking on this project? Did you learn anything about bees through this project that stands out in your mind? I've always been interested in insects, and was aware of the plight of bees before the project came up, but I didn't know the actual specific — and shocking — statistics in regards to the bees I was asked to illustrate. The agapostemon virescens was familiar to me from childhood, as a colony had an established burrow in my family's yard, but I knew far less about the bombus affinis, or Rusty Patched Bumble Bee. I was absolutely shocked to learn that the once widespread bombus now had a miniscule territory, essentially only existing in Pinery Provincial Park in Ontario. I remain baffled as to how something as small as a bee, something so ubiquitous to anyone in a temperate climate, could be reduced to the extent of disappearing altogether — so I'm quite happy I was able to work on something that raises the profile of these bees on a nation-wide scale. As an illustrator, was there anything that you learned from this project that has impacted you or the way you work? Aside from the disheartening statistics on bee populations, this stamp project (as well as the previous pitch) really allowed me to dig into my process, refining how I go from concept, to sketch, through refinements, and onto finals. By the end of it, I had eliminated one entire program from the usual batch of software I had been using, which has sped up my work considerably. What is the single best thing about having your work on a postage stamp? It was, without a doubt, having my grandma call me from the post office after having purchased a pile of my stamps. She had arrived as they opened to make sure she could buy a bundle. Aside from that, seeing friends and family use them to mail letters (and in my sister's case, wedding invites) has been special. Interacting with stamp collectors has been pretty neat, too. Between this and your recent illustrations for the NHL, you’ve reached some pretty spectacular heights lately. 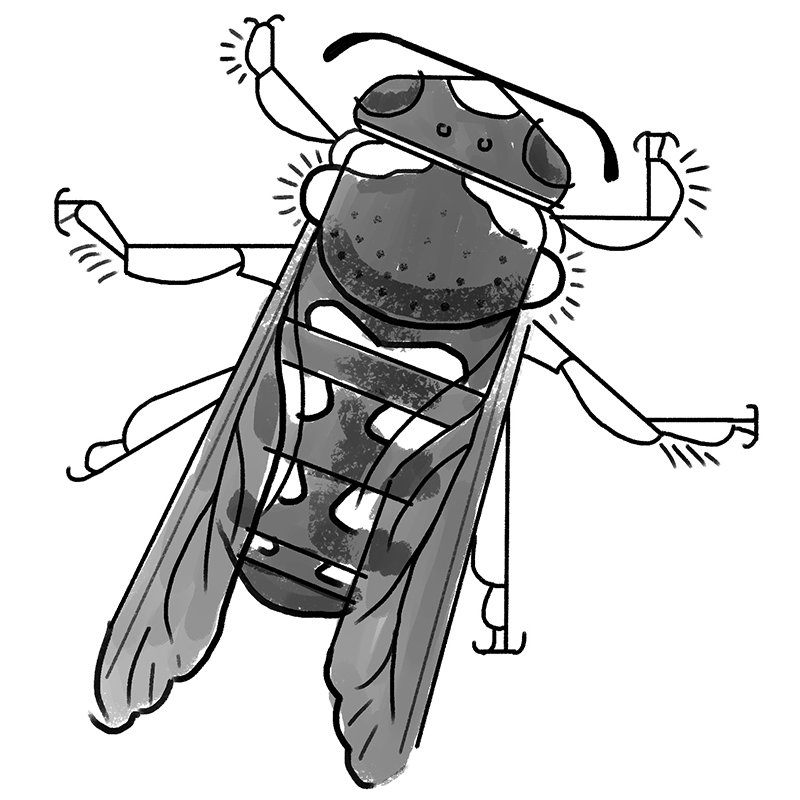 Is there anywhere in particular that you’d like to see your illustrations next? The NHL work was a dream come true for me. Illustrating sports, and hockey in particular, is very comfortable for me. I feel my understanding of the game — everything from the speed, the positioning, to details as small as the way the equipment is worn — makes drawing these players in motion as fluent as an oft-spoken language to me. Saying this, I'd love to continue working the NHL, be it the league itself or a specific team. Having work on tickets, programs, arena signage and other collateral is certainly another dream. I wouldn't say no to any other sports, too. During my co-op placement, I worked with Tavis Coburn - he had just had his work for Arsenal FC installed at Emirates Stadium, on an absolutely massive scale, and seeing that has stuck with me ever since. So, yeah - I'd say my aspirations are stadium-sized at this point. Dave is a 2008 graduate of the program. You can view more of his work at davemurrayillustration.com. All images provided by Dave Murray.